There are quite a few ways to have a shocking early retirement in Costa Rica – way more than seven, but let’s keep it short and concise. Becoming an expat is a lot of fun. I know, because I became one about 38 years ago. In all those years, I’ve figured out the best way to enjoy the country and its people: don’t do business, and just retire. It is surprising that there are so many people who are deeply disappointed by their experience of retirement in Costa Rica. They’re everywhere: on the online forums, in the comment section of every online newspaper, and in every bar with a gringo clientele. And guess what? It is their own fault, most of the time. When you talk to those who are having a shocking retirement experience, they’re fed up, but they always assign the blame elsewhere. Often, they decide to stay in Costa Rica and be unhappy. My agents and I have relocated thousands of expats in the past 20 years or more. We’ve seen quite a few unhappy expats leaving, mostly because of what they did to themselves, or didn’t do. Here are some ways you can learn from other’s mistakes. You didn’t really do your homework well enough before retiring in Costa Rica. You lurked on some expat forums for a while and saw that some people were very happy in a certain location. You found a real estate agent who sold you that place you’ve been dreaming about all your life. One morning, you wake up and realize you hate the place, you’re bored and you don’t like your neighbors. You hate the country and everything in it. It will take you forever to sell the property and move on because you bought it at too high a price. How to avoid it: Rent first, try different locations, and spend the first two years of your retirement looking around. For many future expats, living in paradise means palm trees, white sand, a turquoise ocean, and piña coladas. They envision waking up late, having a huge breakfast at a local restaurant, and spending the rest of the day surfing and lying on the beach. Right after a nice Surf and Turf dinner, they’ll drink the night away. Retirement is one big party. Before you know it, you’re going through your life savings. Too late, you figured out that this lifestyle is way over budget. Too late, you and your spouse figure out that you’ve become alcoholics. You’re in for a shocking retirement: your savings are gone and you will have to live on Social Security. How to avoid it: Life is not a party. It never was, so why start now? When you retire, take a three-month vacation to the nicest paradise your budget can pay for. Then go home and think hard about what you want to do the rest of your retirement. While surfing the web, you found information about how to retire in Costa Rica. You didn’t double check the information you found there; too late, you figured out that this information was posted years ago. Everything has changed. Now you need to pay much higher taxes on the household you brought, and customs is holding your appliances. Your immigration lawyer says you brought all the wrong documents and that you need a much higher income to apply for residency status. Your health insurance will not cover you in Costa Rica and the medicine you need is not available here. How to avoid it: Make a list of everything that is important to you before you move to Costa Rica. Then do detailed research on each important topic. Don’t base your knowledge on what you find on online forums and Facebook pages. Hire professionals who know what they’re doing, it’s easy to find them online, but you have to make the effort. It sounds fantastic: you are going to have all that free time, especially when you’ve worked so hard to get to this point in life. The cost of shopping, arts & crafts, travel, and all the expenses associated with new hobbies can add up tremendously. How to avoid it: Make a list of all the hobbies and things you want to do. Then create a retirement budget based on this list. Include unexpected expenses, so you have some extra to play around with. You’ve worked all your life and so did your spouse. To stop working totally and suddenly is difficult for many. Now you are in each other’s face all day long, every day. Watching the sunset and drinking piña coladas might be fun for a while, but that’s not you. How to avoid it: Before you retire, put your ear to the ground for future options of part-time work in your own profession. Try to keep a few consultancies or try to get involved in your local community. Teach English to the poor, help locals build their business – do something. It is either fulfilling to give back a little to your new country or it creates an extra income. And remember this: be prepared to work harder at your marriage than ever in these new circumstances. You have bought this awesome place in Costa Rica because you could get it at a bargain price. Unfortunately, after a while, you find out that this is not the right location for you and you miss much-needed amenities. How to avoid it: Rent first to find out where you want to live. 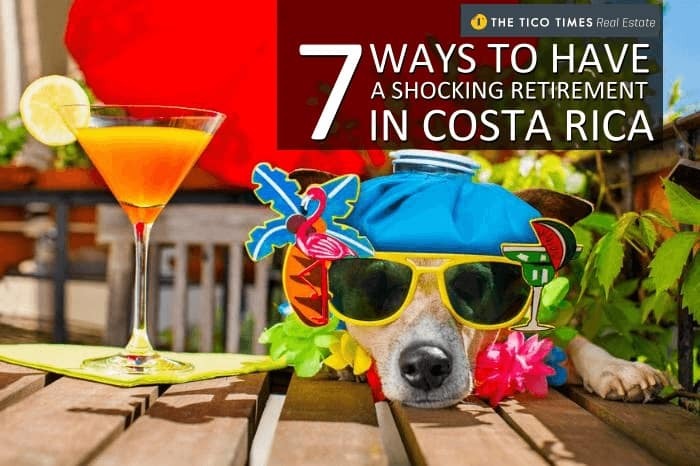 If it’s too late for that, read the article “8 Reasons why your property in Costa Rica has not sold in 7 years.” If you buy the wrong property, you’re signing up for a shocking retirement that you don’t deserve.